On paper the Canadian dollar is struggling to keep up with US currency and doesn’t seem like a wise investment. But when you discover that the Canadian Mint now makes an entire line of Star Trek-themed collectible currency, including this delta-shaped gold coin, how could you possibly resist buying them all up? Made from 99.99 percent pure gold, this coin, shaped like the Starfleet insignia worn by everyone serving about the USS Enterprise, has a face value of $200, but it will actually cost you $1,300—in Canadian funds. It’s legal tender, though, which means you can spend it anywhere (in Canada) you like, but only as $200 in currency. 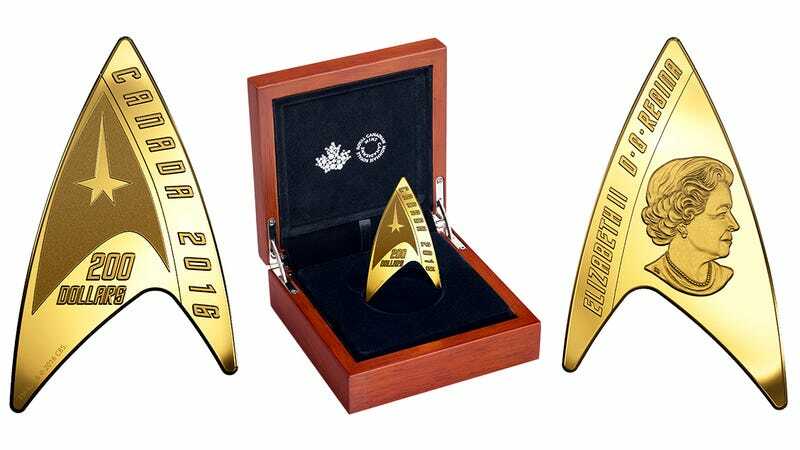 But if a $1,300 gold coin isn’t quite in your budget, the Canadian Mint actually has an entire line of Star Trek coinage for you to collect, starting at $20 for a $20 silver coin featuring the USS Enterprise firing its phasers. In recent years the Mint has also developed a way to print full-color imagery on its coins—including ones used in circulation—so if you’d rather have Spock or Uhura rattling around in your pocket, there are a couple of cheaper coin options featuring them as well.